One of the biggest growth areas for home computing this decade has been the humble network. At the turn of the century it was most often the case that we used a single machine connected directly to a phone line whereas now it would be rare to find a home that hasn’t been networked to some extent. Applications range from wireless Internet on a laptop, file sharing between two machines, a hard drive set up to distribute media around the home, a wireless printer which all the family can access or a games console piggybacking the main Internet connection. The conventional methods of deploying a network around your home are well known; you can either connect via a network cable or connect wirelessly over the airwaves and while usually suitable, both methods have potential disadvantages. A wired network is of course limited by a physical connection being needed between your devices whereas a wireless network can fall down if installed in to a house that doesn’t have favourable conditions; a particularly large house or one with particularly thick walls for example. A route that few people are familiar with is that of AC Networking. Although not the ideal solution for many, it does have some quite distinct advantages if you find that a conventional wired or wireless network lets you down. To get started you simply need a minimum of two power line access points which can then be plugged in to any of the existing plug sockets in your home for the two to begin talking to one another. The technology works by modulating a carrier wave along the existing power cables in your home therefore your entire home wiring essentially becomes a network cable that can be tapped in to at will. Because you are using the mains cabling that runs all throughout your house the distance or objects between the two points are irrespective while at the same time removing the need to lay dedicated network cabling. Plug your broadband router in to an power line adaptor downstairs and your computer in to one upstairs and with the minimum of fuss you’ll have a physical connection between the two. You can restrict access to the network by implementing a number of security procedures similar to those present on a wireless network but owing to the fact your neighbours will be on a different wiring ring, these features are potentially redundant. What makes the technology more useful is that you can combine elements of power line, wireless and conventional wired networking together in the one location by building on the strengths of all three technologies. You could for example have a wireless router plugged in to both your broadband connection and a power line adaptor with a second router plugged in to a power line adaptor upstairs; by having two wireless routers in opposite ends of the same building the chance of being without wireless signal would be slim. Alternatively, have the wireless router plugged in to both your broadband connection and a power line adaptor downstairs but upstairs plug a power line adaptor straight in to a conventional wired network switch in a kids game room upstairs. They could then connect a PlayStation 3, Xbox and PC directly in to this switch therefore benefiting from a physical connection straight in to the router downstairs without having to worry about issues such as wireless signal strength. 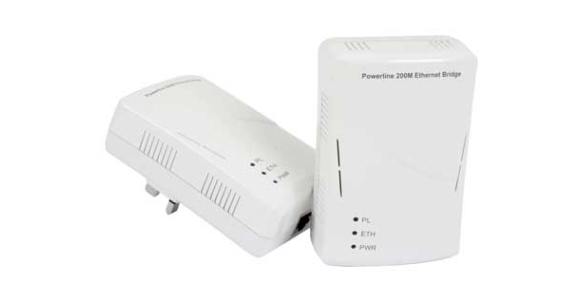 Most modern day power line adaptors support 200Mbps which compares favourably to a standard wired network which would run at 100Mbps and a standard ‘g’ rated wireless network running at 54Mbps. Prices start at around £60 for a pair of power line access points.